News and notes on the climate of Quelccaya Ice Cap. The snowy dry season of 2018 continues in the Cordillera Vilcanota. Yesterday's Sentinel-2 image (above) reveals a landscape blanketed by snow above 4500-4700 m. Quelccaya Ice Cap (lower right) is difficult to delineate, suggesting substantial accumulation at the margin. Hopefully our instrumentation continues to record hourly snowfall at the summit. Note the variation in color of lakes just west of the glacier, surrounding the area of our camp (labeled). This reflects varying suspended sediment input, with relatively high concentrations apparently flowing into the Qori Kalis proglacial lake (north of camp); snow is accumulating, while also melting and delivering sediment to the lakes. The 'double' lake to the northwest of camp (and Sibinacocha) appear dark blue, as upstream wetlands (bofedales) filter sediment from freshly-exposed areas proximal to the glaciers. We will be in the area during the second half of August, measuring snow and recovering weather station data. Fieldwork will occur later than normal, allowing an assessment of what appears to be an anomalous year. Although this snow will be beneficial to glacier mass balance, the toll on camelids (llama, alpaca) could be severe - without warming solar radiation typical of the dry season. [UPDATE 7/26: A press release from SENAMHI* earlier this week (23 July) describes snowfall in the preceding 72 hours above 3,800 m in the Andes, accumulating to 20 cm. In conjunction with clouds, they warn of low temperatures and prolonged snowcover reducing food for livestock. Gustavo Valdivia wrote yesterday learning details of the situation in the Cordillera Vilcanota. He received a call from the Phinaya community president, who described the situation as critical, because a lot of alpacas died in recent days. The local people agree that the weather is very unusual. Press releases from SENAMHI can be found here (in Spanish), with a machine translation here. [UPDATE 7/27: Today I learned from Bronwen Konecky (Washington University) that SENAMHI is making daily meteorological summaries available on their website. The closest station to Quelccaya - and one of their highest - is Sibinacocha, at ~4890 m (labeled on map above). These data show 11 mm of water equivalent precipitation on 21 July, followed by 5.9 on the 22nd. Since this automated station is located at the southern end of the lake, the image above suggests that considerably more snow fell at higher elevations. The regional nature of this event is demonstrated by daily totals from Sicuani (~3600 m, 45 km to the SW); very similar daily totals were recorded. During our April/May 2016 fieldwork, we were joined by a BBC Natural History Unit crew. 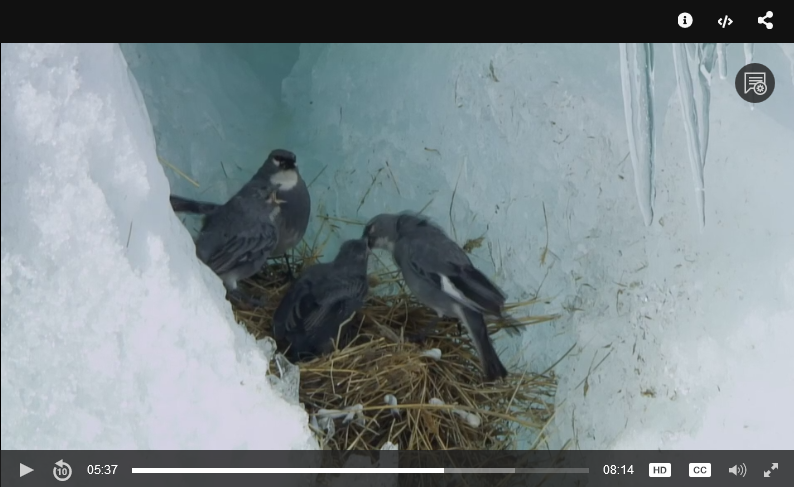 Their objective was to film White-winged Diuca Finches nesting on the glacier, a breeding behavior unknown among all other bird species. The project timing was fraught with uncertainty, for only 2 other active Diuca nests had ever been observed, and the 2015-16 El Niño event considerably impacted Quelccaya climate (overview here of a manuscript now out for review). Foremost in our minds was whether we could find active nests to film, when we arrived in April. 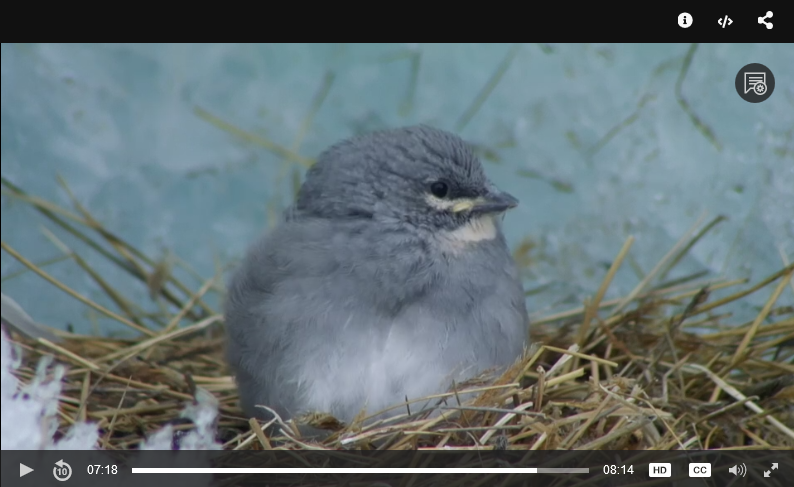 Fortunately, our timing was perfect; we observed all stages of breeding behavior, and successfully installed a remote camera at one of the nest sites. After a year in production the segment aired on BBC as part of an episode on the Andes, in the series Mountain: Life at the Extreme. Links to the BBC series are here and here. 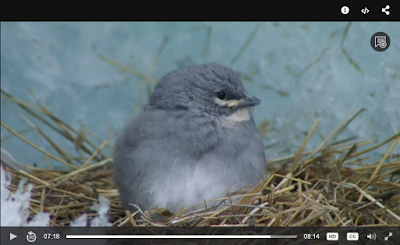 This month, BBC Glacier Bird footage will premiere in the United States on PBS. The series takes a new name, Kingdoms of the Sky, with a new presenter, but otherwise appears identical: a three-part documentary "revealing the extraordinary animals and remarkable people who make a home on the iconic mountain ranges of the world - Rockies, Himalaya and Andes." The three episodes will initially air on Wednesday evenings, beginning with The Rockies on July 11 at 9 PM EDT. Himalaya premieres one week later on July 18, and Andes premieres on July 25. The PBS series website is here, and DVDs can be pre-ordered now. At the moment, the Glacier Bird segment can be viewed from the right-hand side of the series homepage. 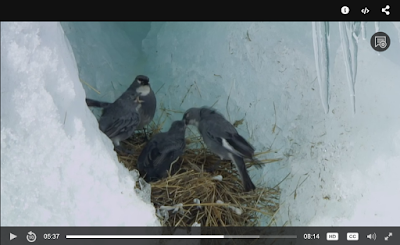 Click on "Meet the Bird that Nests Inside Glaciers" to see the first-ever footage of Diuca speculifera nestlings. Even better is an 8-minute, behind-the-scenes look at Quelccaya filming, available from PBS here. Images from that clip are included above and below. Our extended fieldwork with BBC in April 2016 was good fun, and provided new observations of Diuca and other high-elevation species. Please check our website for the Glacier Bird, and stay tuned for a new publication (still in review; contact us for a synopsis of the paper, or a pre-print). 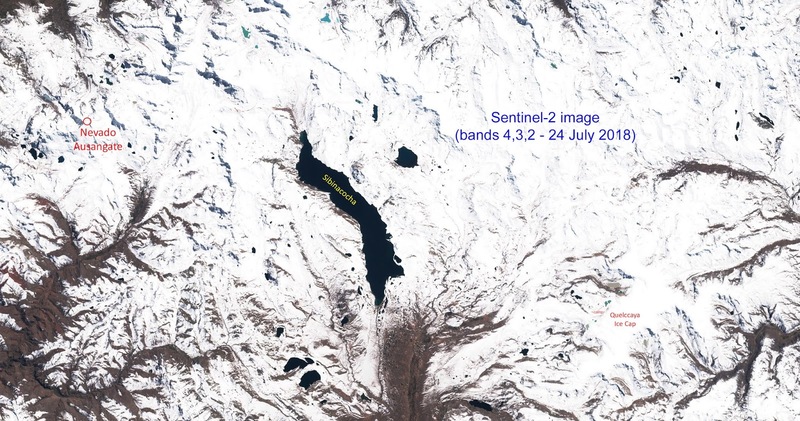 The Cordillera Vilcanota remains snowy, as illustrated by the Sentinel-2 image above from 4 July. Snowcover at high elevations, on south-facing slopes, and on glaciers has changed very little over the past month. At Quelccaya Ice Cap, bare ice is exposed only at the lowest elevations of outlet glaciers (e.g., Qori Kalis, on west side). 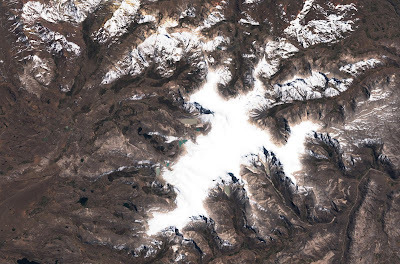 Extensive snowcover on the glacier is keeping the albedo high, minimizing mass loss... at least for the moment. Quelccaya is not alone in being unseasonally snowy this year. For example, in the Karakoram Mountains (Pakistan) climbing teams on mountains such as K2 are finding dangerous avalanche conditions due to heavy snowfall, during the core climbing season. More details can be found here. Kilimanjaro is also unusually snowy for July, the result of above-average accumulation during the March-May wet season. In Northeast Greenland, the winter of 2018 brought twice as much snow as the long-term average, and snowcover into early July remains so extensive that Sanderlings and other shorebirds may not even attempt nesting this year. The late snow is having large consequences for the ecosystem. Finally, snow on portions of the Greenland Ice Sheet is resulting in the "least surface ice loss in decades". As Jason Box notes via Twitter (@climate_ice), these persistent extremes in patterns of atmospheric circulation are an expected signature of climate change. Quelccaya Ice Cap is the largest glacier in the Tropics, located at high elevation in the Cordillera Vilcanota of Perú. The UMass Climate System Research Center has been conducting climate research at Quelccaya's summit since 2003. 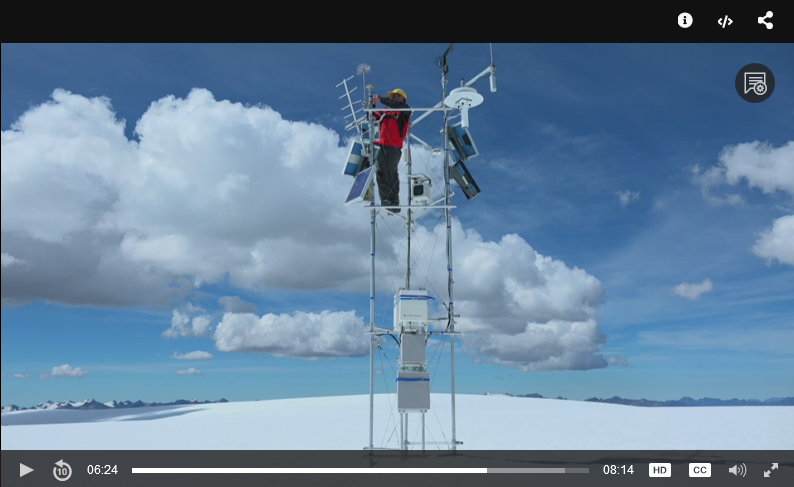 In 2007, collaboration began with NOAA's Global Climate Observing System (GCOS) program, to obtain the first high-accuracy air temperature measurements at a high-elevation site (5,680 m or 18,630 feet). We welcome your questions, comments and observations pertaining to any aspect of climate or avian ecology of the Quelccaya region. Support for this project derives from the National Science Foundation (Grants No. 0402557 & 0952829, awarded to the Univ. of Massachusetts), and NOAA (OGP Climate Change Data and Detection Program & U.S. 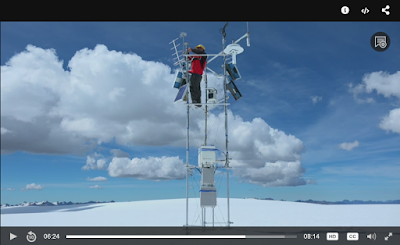 Global Climate Observing System; Grants NA09OAR4600215 and NA10OAR4310228, awarded to the Univ. of Massachusetts). Any opinions, findings, and conclusions or recommendations expressed in this material are those of the authors and do not necessarily reflect the views of the National Science Foundation or NOAA. Thanks to Felix Benjamín Vicencio and Vicencio Expeditions, who provide fantastic field support, and to Mike Rawlins in the UMass Climate System Research Center, who keeps tabs on telemetry. We love Mountain Hardwear gear, Teko socks, Julbo goggles, and Snowmetrics tools.